See websites of the Metropolitan Police Department, etc., for details. 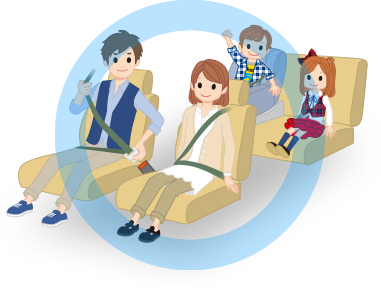 Driver and all passengers must wear seatbelts, including rear-seat passengers. If seatbelts are not worn, then insurance payouts may not be made to accident victims. Don't violate parking rules.If you do, complete all required procedures (appearance, procedures, payment) before drop-off. At the time of a drop-off, show traffic violation notice and payment receipt. You'll pay an illegal parking penalty of 25,000 yen (standard vehicle) if notice and receipt are not shown. Paid penalty will be refunded upon presentation of a notice and receipt when the fine is paid later. Refund will be transferred to your specified bank account minus handling fee. 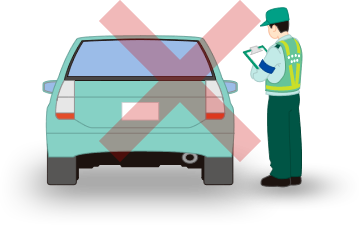 If a fine or penalty payment isn't confirmed, driver's name will be registered in the All Japan Rent-a-Car Association, whose members may refuse rental. Check your license for validity etc. International driver's licenses issued by Geneva Convention members: 93 countries and two administrative districts (excluding Japan). Present your international driver's license and passport to rental site staff. International driver's licenses are valid in Japan one year from the date of entry on passport or until expiration date, whichever is sooner. For alien residents, one year from the date of entry commences with entry date on passport and does not commence upon entry to Japan within a three-month period of departure and return. For periods exceeding three months, date of entry commences upon return to Japan. Regarding driving with international driver's license issued by member countries of Paris, Washington or Vienna Conventions. Click here for details. Licenses issued by seven countries and one region (Switzerland, Germany, France, Belgium, Slovenia, Monaco, Estonia and Taiwan) can be used.Click here for details. Limited to licenses with Japanese translation made by people specified by law. International driver's licenses are valid in Japan one year from the date of entry on passport or until expiration date, whichever is sooner. For details, check the Metropolitan Police Department's website (Foreign Driver's License).